It’s funny how certain things work out at times. Take writing for example. Honestly, it’s always come very easily to me. My 12th grade English teacher once commented that I’m lucky she enjoys reading my essays so much, or she would probably fail me for turning them all in two weeks late. When I started this blog, I put a lot of thought into the food and recipes (obviously!) and of course, as you know, I thought a lot about the photography. But the writing? It was always an afterthought, just something I did in the last few minutes of my posting. And I guess it worked. Because suddenly in the last few weeks I’ve gotten a ton of comments from readers, both of my magazine column and my blog, all telling me how much they enjoy my writing. And suddenly my writing went from something I never thought about to something I need to stress over at least as much as my pictures. And that’s what led to me sitting in front of my computer, staring at an empty blog post for twenty minutes. Isn’t it strange how pressure turns something effortless into something you just can’t do? Speaking of pressure- this cupcake recipe is of the no-pressure variety. It doesn’t use any unusual ingredients, so you’re likely to turn to this recipe when you need a good dessert in a pinch. PS- they are absolutely delicious! Also, I think I just wrote a blog post. Pressure and all! Sift together the flours, baking powder, salt and cinnamon. Set aside. In the bowl of an electric mixer, beat together the butter or margarine and sugar until smooth. Add the eggs and vanilla, one at a time, beating well after each addition. Turn the mixer to low, and add the flour 1/3 at a time, alternating with the milk, 1/2 at a time. Mix until just combined. Don’t over mix. Pour the batter into the prepared cupcake pans, filling them 3/4 full. Bake in the oven at 350 for 10 minutes for mini cupcakes or 20 minutes for full size cupcakes. 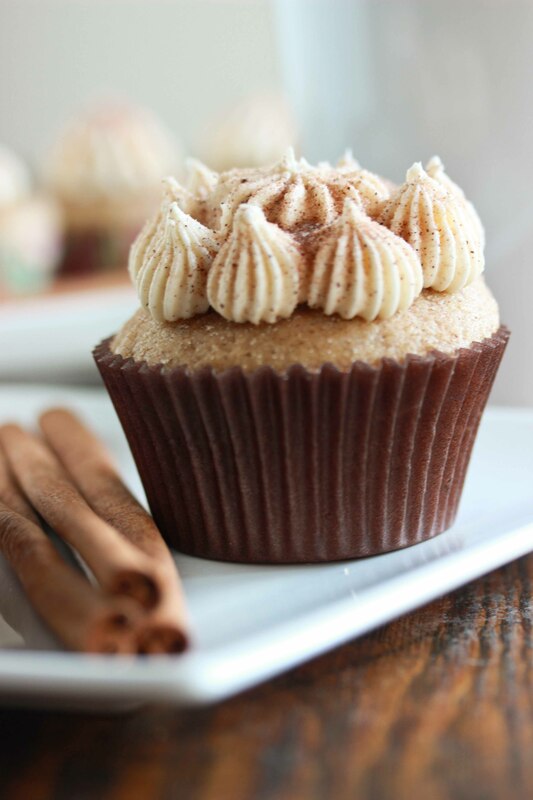 Set aside to cool, then frost cupcakes with marshmallow fluff frosting when they are completely cooled. *Note: to replace the cake flour with all-purpose flour, use 1 1/2 cups minus 3 Tablespoons all purpose flour. You can use it as is, or you can replace those three tablespoons of flour with corn starch. In the bowl of an electric mixer, beat together the butter, vanilla, marshmallow fluff, powdered sugar and milk until smooth, creamy and stiff enough to pipe. Pipe frosting onto cooled cupcakes. 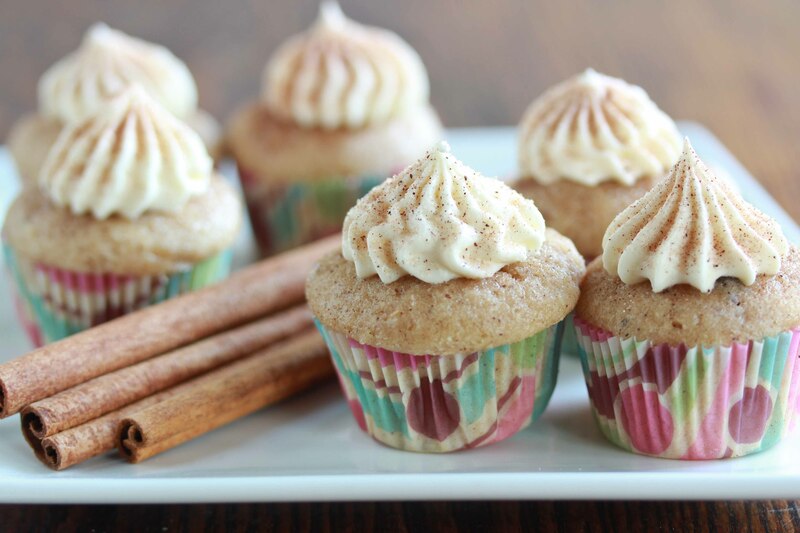 Combine the sugar and cinnamon in a small bowl and sprinkle over frosted cupcakes. Awesome, I am sure you will love them! I think it’s wonderful for you that you are getting such great feedback on your blog writing. Very well deserved. 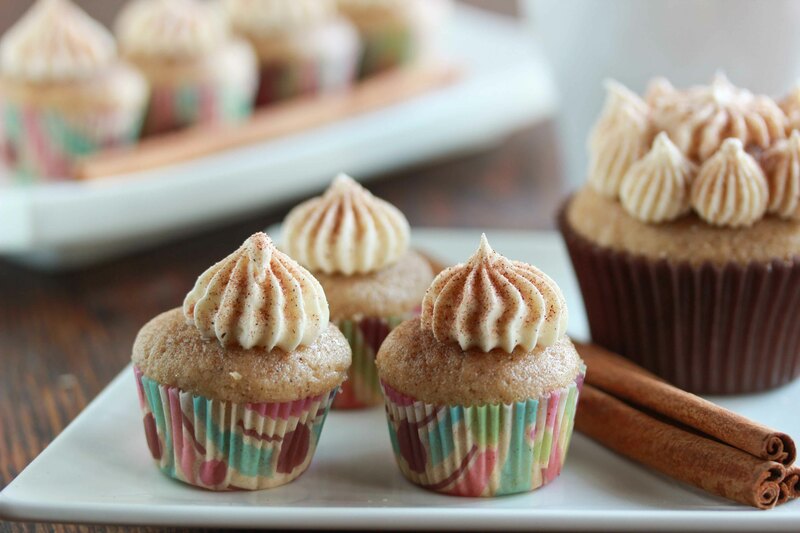 As for these cupcakes…wonderful! This are really pretty. Great for the grandkids. I’ll take 3 please 😀 I definitely will be baking these up! Those cupcakes look seriously delicious – nice one! These look amazing! Good pareve cupcake recipes are hard to come by! Thanks for yours! Hello delicious! I like the marshmallow paired with snickerdoodle, would’ve never thought of it myself! Hey, your food looks real yummy, do you only do kosher food and if so, what does this involve. What do you exclude to make a meal kosher? How many cupcakes does this batch make? I got 37 mini cupcakes and 11 reg cupcakes with the batter. Uh Maze ink! The batter is some of the best I have ever had! This recipe made eggs act lee 24 regular sized cupcakes with a nice round top. Thanks so much!